In Tower of Hanoi you, the almighty player, have the honourful task of moving a rainbow from the common and meaningless left to the adventurous and vast right of the screen. However, there are two constraints! One, thou shalt move only and only one bow at once. Two, thou shalt only place smaller bows into bigger bows. Rumour has it that certain monks have moved a tower somewhere else in Hanoi. Therefore, moving a rainbow can't be too hard. Or can it...? Source will is available on GitHub. It should compile easily on a linux platform if you've got the SFML2 libs. 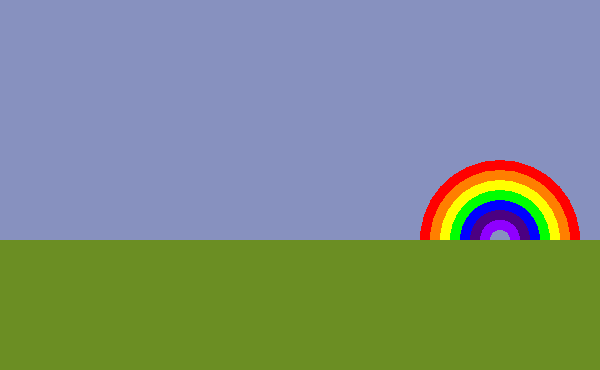 Rainbow of Hanoi was coded in C++, and the graphics were done with SFML2. The compiler I used was the MinGW C++ compiler. This is the first time I used SFML in such a short timespan. Space for general menu interaction. Left & right keys for interactions in-game.